Like most people who have dabbled with supporting gaming projects on Kickstarter, my experiences have been mixed, but mostly good. Happily, I’ve missed most of the big Kickstarter gaming disasters, like the Dust fiasco or the Up Front take-the-money-and-run and all of my RPG related Kickstarters have gone well (See here and here). My latest one was Trenchworx Tanks in Manchuria Kickstarter and I was very happy with the results! However, I also supported Baker Company’s Winter War Kickstarter and got about half the expansively promised figures, which still made it a very good deal, but made for a much more angst filled execution. Unfortunately, I know a fair number of folks who have gotten nothing out of that one, so I do count myself lucky! Really, I just wish that I had gotten the M1927 Infantry Gun out of it, as no one else makes it to my knowledge. So, while I understand the risks, I love that Kickstarters have expanded what is available to us as gamers and will continue to support projects, after proper due diligence, of course! The first project that I want to talk about isn’t even a Kickstarter, but rather a pre-order for figures that will be available at Salute on April 25th. Bad Squiddo Games has made it their mission to produce realistically proportioned and equipped female figures and up to now they’ve concentrated on fantasy and dark ages figures. Since many of these will get used for fantasy roleplaying, that makes a ton of sense, but I’m happy to report that they will be producing a set of Soviet female soldiers in 28mm, which, yes, I’m jumping on. Details are here. For those interested in the role of Soviet women in combat and the extent to which they fought, see this paper as a starting point for further research. This release has certainly whetted my appetite to find out more and isn’t that the whole point of historical miniatures? Next up is a Kickstarter from Bob Emmerson of Mad Bob Miniatures who ran the succesful Hungarian Tanks Kickstarter in 2014. His 1/56 vehicle project this time is French Vehicles, whcih very helpfully include some of the German “Funnies” of the 21st Panzer Division in Normandy. If you’ve been looking to play the Kampfgruppe Von Luck pint sized campaign for Chain of Command, but haven’t wanted to proxy vehicles, then this may be of interest to you for the PaK 40 auf Somua MCG. For what its worth, Warlord already does the P107 halftrack and Mad Bob does the Lorraine Schlepper, so I think this is the last piece of the puzzle! 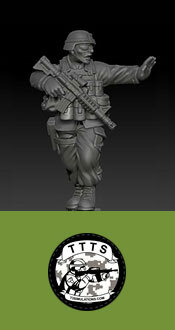 Moving to more modern combat, Miniature Building Authority is running a Kickstarter for Modern Figures for Gaming, which consists of 28mm modern US and generic OPFOR figures. The sculpting is by Bobby Jackson and the figures look amazing! The prices are a little higher than what we are used to in Historicals, but in this case, probably worth it. Honestly, I’ve been waffling on this one, as I’m trying to resist buying figures that aren’t going to be used in the immediate future. I know Fighting Season from Too Fat Lardies is coming later in the year, but I’m just not sure this is the “One Thing More” I promised myself I could do when the year started. That slot is probably going to be taken by Sharp Practice 2 in period TBD! 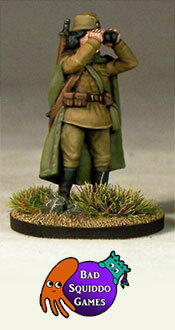 On top of that, Eureka USA has announced that they are starting a range of 28mm WW2 Soviets with previews due at Cold Wars and both Campaign Games and Logistics and Gothic Line Miniatures are due to release their 28mm WW2 Romanians soon, so the pressure for me to break from “do one thing at a time and finish it” rule is growing! Hi, I’m Ed and I’m a figure addict….